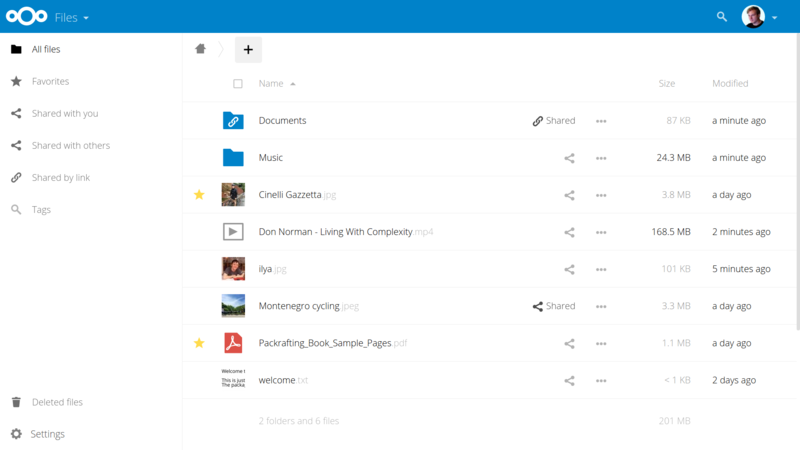 NextCloud is an open source software package that lets you install a private cloud where you control the data. Think of services like DropBox, Google Drive or OneDrive. Those services are great, but you’re handing your data to a third party. NextCloud provides similar services, but on your own hardware or private host. If you’re familiar at all with setting up your own website, installing and configuring NextCloud should be a breeze. Or if you prefer an even easier path, NextCloud has partnered with several providers to help you get up and running in no time. To get started, you’ll want a LAMP server (Linux, Apache, MySQL and PHP). CentOS or Ubuntu can help you easily get a server up and running. Once you have your server, the steps are simple. The wizard is simple to run and is only one page where you’ll create your administrator username and password, set your data directory where files will be stored, and create your database connection. Once your wizard is complete, you can login. You’ll first be presented with a welcome screen, as will any new user. From here you can follow links to download desktop sync apps or mobile apps where you can access your data from anywhere. You also have the ability to sync your mobile contacts and calendar with NextCloud. This isn’t enabled by default, but it’s so simple to add the functionality. While logged in as your administrator user, click the drop down menu at the top left of the page where you see “Files”. Select + (Apps), then browse to “Productivity”. From there you can easily enable the Contacts and Calendar apps. After you close the welcome screen, you’ll be presented with a default set of files that will look something like this. From this screen you can download the files that are there, or upload new files. 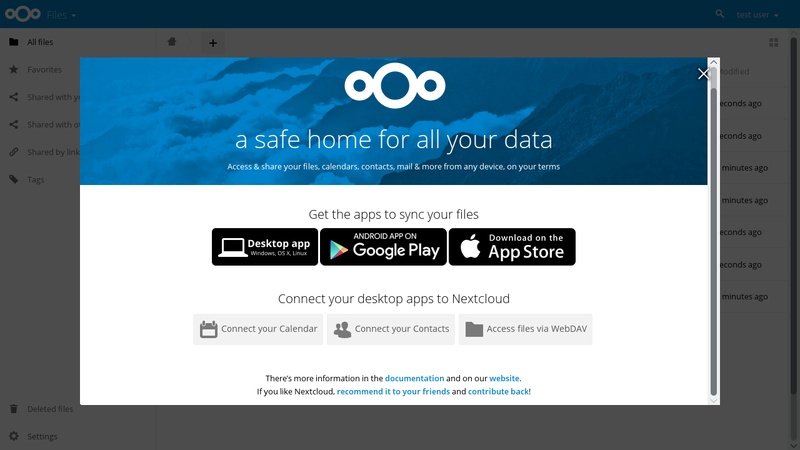 The beauty of NextCloud is that you can access this interface from anywhere on the web and it always works the same, or you can use any of the desktop sync clients available from the welcome screen to access your files on, say, your work computer and seamlessly upload the changes so that they’ll be ready for you when you get home. 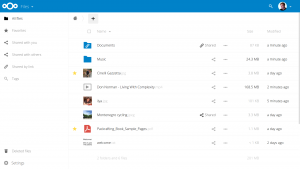 There are so many other features that can be added to NextCloud such as online document editing via LibreOffice online technology, as well as video conferencing via Spreed.me. Documentation exists on nextcloud.com that gives details on how to configure those services. If you want to see what the web interface looks like ‘live’, check out the Demo on their website to take it for a spin. I guarantee you’ll want your own!